Inside: If you want to homeschool French and need a program your children can do independently, Rosetta Stone Homeschool is the best choice. It’s perfect for busy homeschool moms! My daughter has always loved languages. From an early age, she listened carefully whenever she overhead conversations in foreign languages and even made up her own languages in pretend play. While she loves all languages, she eventually narrowed her focus to French. For whatever reason, she developed a love for France and has grand plans of travelling there as a family one day (as a family of soon-to-be seven, we’ll see!). This post was sponsored by Rosetta Stone Homeschool. I was given access to the program for free and compensated for my time. I was not required to give a positive review, and all thoughts and opinions are 100% my own. Please see my full disclosure for details. One of the things I love most about homeschooling is the ability to structure our homeschool plans around my children’s interests. If they want to learn French, we can! I believe that when children learn what they want to learn (instead of being forced to), their retention and mastery goes far beyond the norm. We have tried a number of free online language learning options. The free versions allowed my daughter to dabble in different languages, learning bits and pieces here and there. However, the free options never gave me complete confidence that my kids were actually going to master any one language. As my daughter’s language learning interests narrowed to French, I started to look for an online language learning program to invest in long-term. Right around that time, I was given the opportunity to try Rosetta Stone Homeschool. I signed up my daughter (8-years-old) and my oldest son (6-years-old), and they eagerly dove right in! There are so many reasons to choose Rosetta Stone Homeschool. One bonus for me as a minimalist mom is that it is clutter-free: no extra papers to file away, no books to store for years until the next child needs them. I realize that doesn’t appeal to everyone, so here are the benefits that every homeschool parent can appreciate. Rosetta Stone’s language learning model attempts to replicate the way native speakers learn language using immersion-based instruction. Other online language programs start with conversational phrases, which can be a good option if you need to interact with native speakers in the near future. Rosetta Stone Homeschool closely mimics that way native speakers learn language. It teaches vocabulary first, teaching single words, then combining two words together, and eventually teaching entire sentences. Nothing is in English: everything is taught using the spoken or written target language, and pictures. I believe this model is especially advantageous for children. 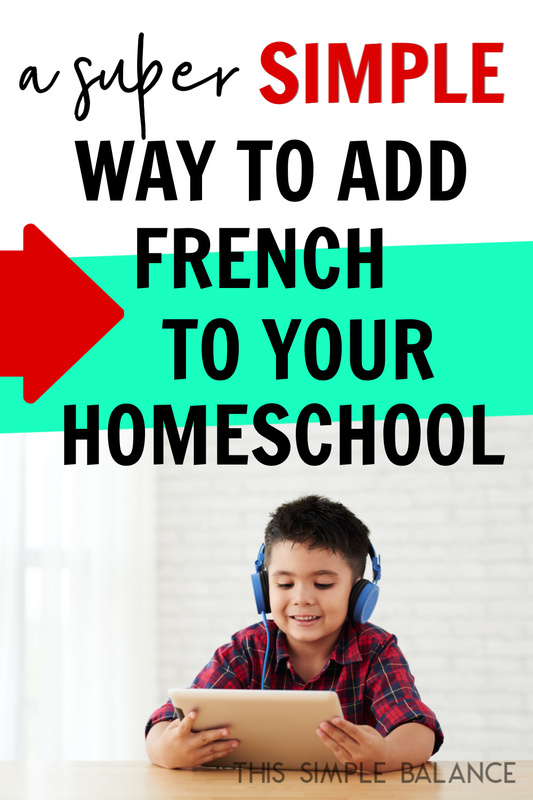 They love the small wins of building their vocabulary and don’t seem at all frustrated by the fact that conversational French is put off to later in the program. When I thought about using Rosetta Stone Homeschool beyond this year, I knew it would be the best option for our family for the best price. I have tried other online language programs, such as language tutoring. While the one-on-one interaction was a definite plus, there is no way we could afford it long-term. I love that with Rosetta Stone Homeschool, you purchase access to the program at a flat rate for the entire year. They can work through it at their own pace. While others may consider Rosetta Stone Homeschool expensive, I believe the cost is well worth both the quality and user-friendliness of the program. As a work at home, busy homeschool mom with a big family, I need homeschool subjects beyond the core “Reading, Writing, and ‘Rithmetic” to require very little direct instruction from me. Whenever I find programs that allow my children to learn independently, I do a little happy dance! The fact that I don’t need to do any preparation or instruction for my kids to learn French is a major benefit of Rosetta Stone Homeschool. My kids both complete their lessons with next to no help from me. It also teaches them how to learn on their own and to work at their own pace. If they want to do an extra lesson that day, they can, and they do. Rosetta Stone uses TruAccent® speech-recognition technology to verify that your child is learning to speak French with the proper accent. And can I just say that it is truly amazing how easily children are able to reproduce what they hear? As an adult, I look at the written word and can’t believe that the spoken French is what it is. Children, on the other hand, seem to pick up the French accent almost at once. I am sure that the older you are when you start learning another language, the more difficult it is to master a foreign language accent. All the more reason to start foreign language instruction as early as possible! What Do You Need to Use Rosetta Stone Homeschool? Getting into the program and setting up the headset may require a little help from you initially. Eventually, children should get the hang of it on their own. 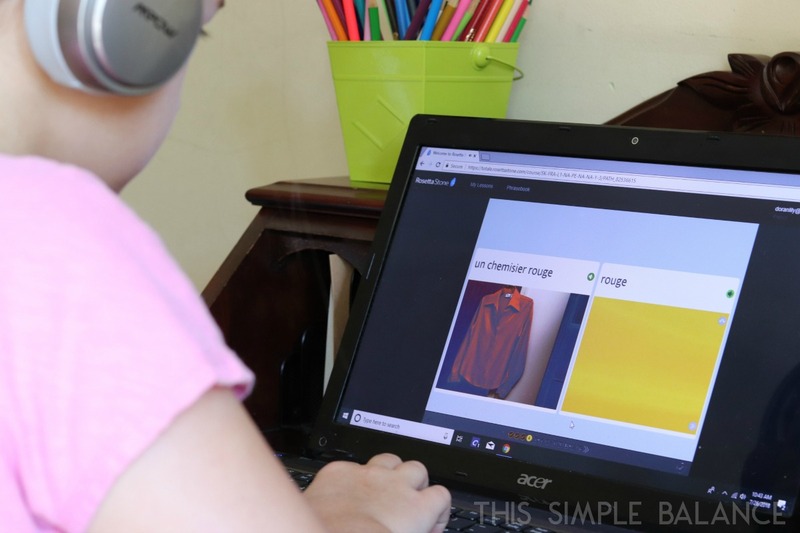 You can use Rosetta Stone Homeschool without continual Internet access, but you will need an Internet connection initially to download individual lessons if you want to use it later while offline. They do offer an iPad app, and if you have a newer iPad, you may be able to use this option. Our iPad is on the older side, and we were unable to download the app. We have an older laptop that the kids use for typing instruction and writing short stories. We were easily able to access the platform using the laptop, instead. I mention the quiet room because we homeschool in a small home. 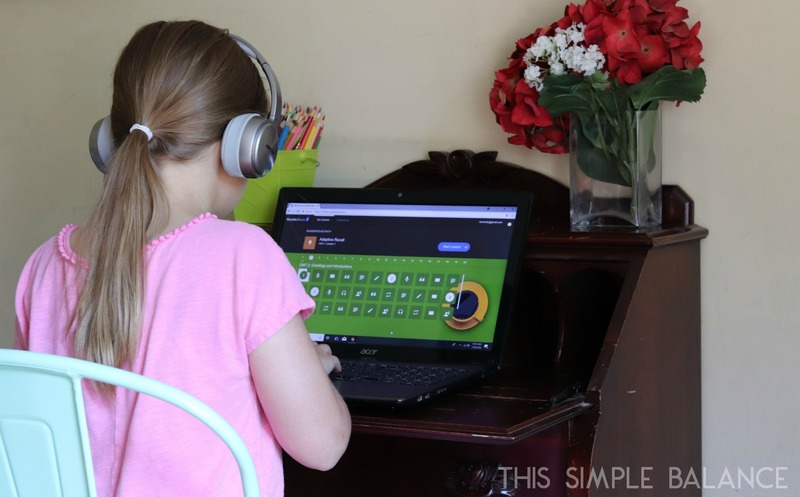 In order for the headset to register spoken responses properly and for your child to hear the spoken French, the room needs to be relatively quiet. 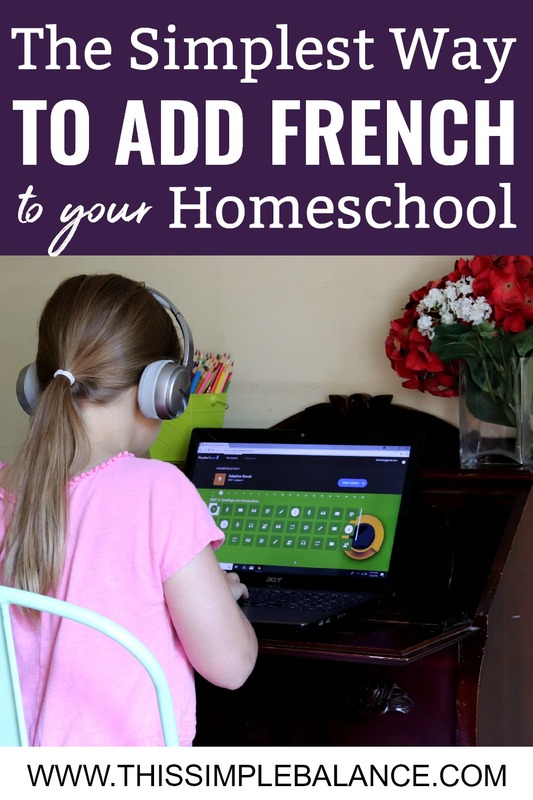 Who Can Use Rosetta Stone Homeschool to Learn French? Children who can read with relative fluency will get the most benefit from Rosetta Stone Homeschool. My 6-year-old can easily complete the majority of the lessons, but he does struggle with the written portion. My 8-year-old (she will be 9-years-old in the fall) is able to do every lesson. Essentially, if your child is a struggling or beginning reader, he will probably not get the most out of the program. I would recommend waiting until his reading has progressed to start learning French via Rosetta Stone Homeschool. Since starting to use Rosetta Stone Homeschool, I have seen definite progress in both of my kids, but especially in my daughter. Because my son struggles with the written lessons, he can sometimes get stuck and need encouragement and help with those lessons in order to complete them. My daughter, on the other hand, can do everything on her own. She loves completing lessons and uses it on a regular basis, often without my prompting. When I hear her speaking French, I am literally blown away by how much she sounds like a native speaker, and I am excited to see her progress the rest of this year. I anticipate using Rosetta Stone Homeschool well beyond this year.